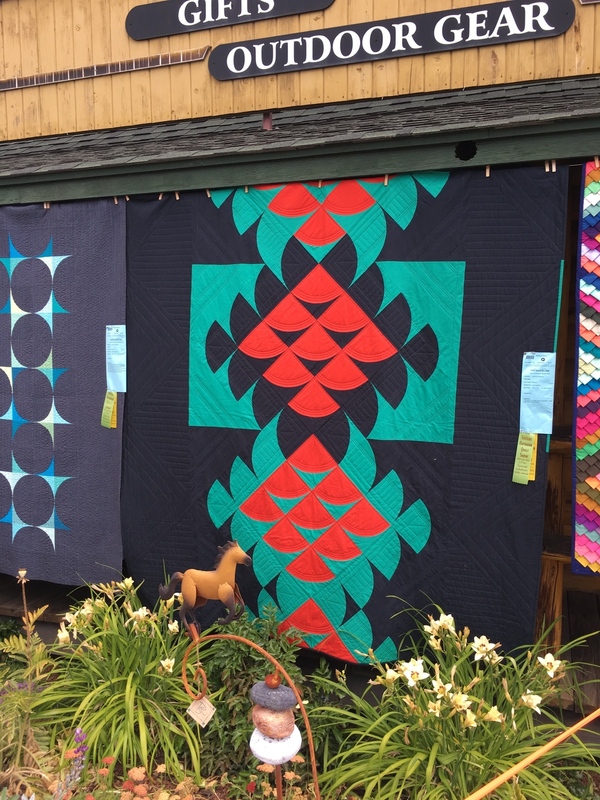 My first Quilter's Affair and Sisters Outdoor Quilt Show! Just wanted to share a little about how much fun I had in Sisters, OR this last week at Quilter's Affair. I have always heard about what a great event this is so, when I was accepted as a teacher, I was absolutely thrilled! It is not often that the hype lives up to the actual experience, but this was one of those rare instances. This was such a well organized event from start to finish and I had tons of memorable moments all along the way. I wish (as always) that I would have taken more pictures, but was so busy taking it all in that I kept forgetting! The students were great and we seemed to get quite a lot accomplished in our 2-day classes. The opportunity to meet and visit with all of the other teachers was better than I ever imagined. 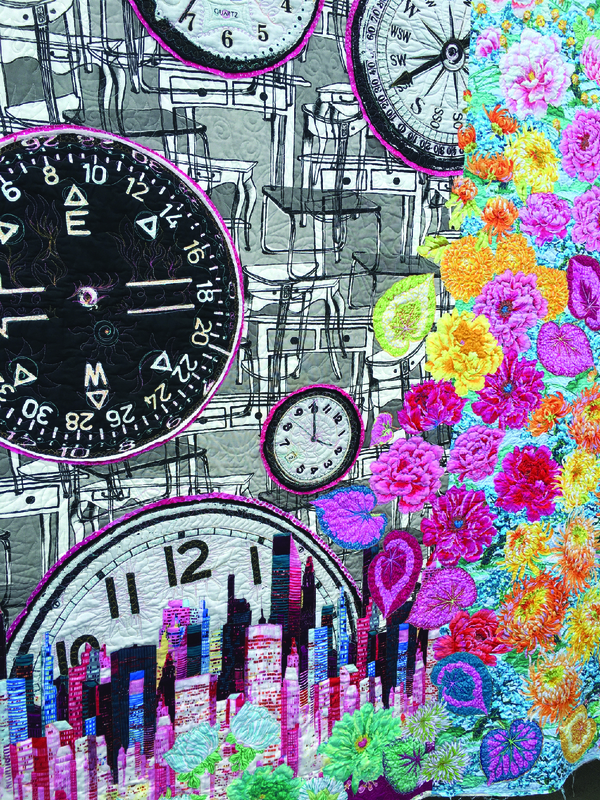 And the actual quilt show on Saturdays was absolutely amazing! On Monday evening we were welcomed to the gorgeous home of Jean Wells-Keenan (owner of The Stitchin' Post) for dinner with her family including her daughter, Valori, and all of the Quilter's Affair teachers. As you can see, we did not leave hungry and the view was gorgeous as we sat outside. That's Kathy Doughty, in the picture at the right, who was the featured speaker on Thursday night. 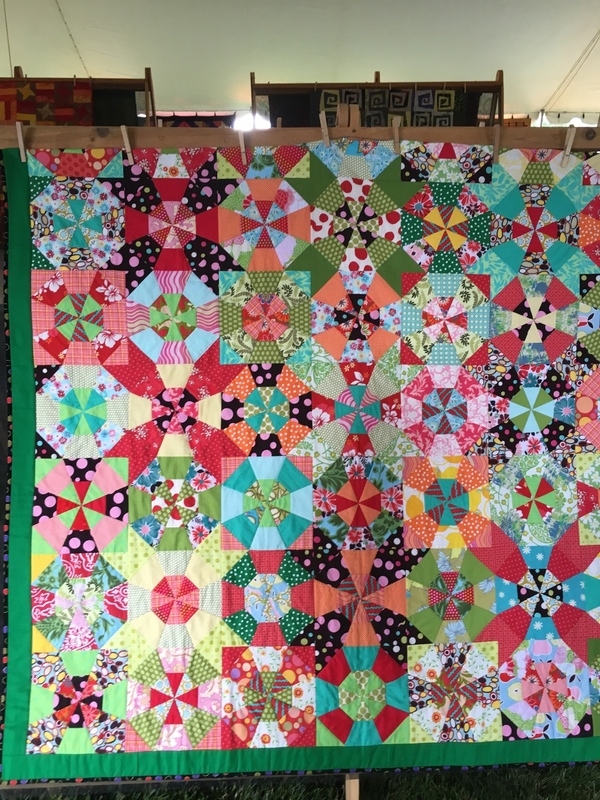 Kathy is a super talented quilter, author, fabric designer for Free Spirit, and quilt shop owner called Material Obsession in Australia. The next 4 days were a blur as I taught my two classes. It was fast and furious, but we got a lot done and all of my students left class with at least one block, and most others completed four or five. Here are some photos of a couple of my favorite memories - lunch every day with the other teachers and a field trip (compliments of Colleen Blackwood, another Quilter's Affair teacher) to the beautiful Metolius River. Another HUGE highlight was Friday night's speaker, Laura Wasilowski, who entertained us and really should take her act on the road. She sang songs and took us along for a little ride on her quilt journey. I haven't laughed that hard in a long time! Then we were up early on Saturday morning to help hang some of the quilts for the outdoor show. I had the pleasure of being Karla Alexander's assistant! The picture on the right shows the fire department hanging quilts on the side of The Stitchin' Post. These are a few of my favorites that were hanging at the show. I was so surprised and excited to see Colleen Blackwood's quilt (first one) that she made with a little help from my Skinny Robin Ruler. This quilt is absolutely beautiful. The next four quilts are mine and then there are just a few more of the many quilts I loved. And lastly, at the end of the day I helped to take down some of the quilts from the show. 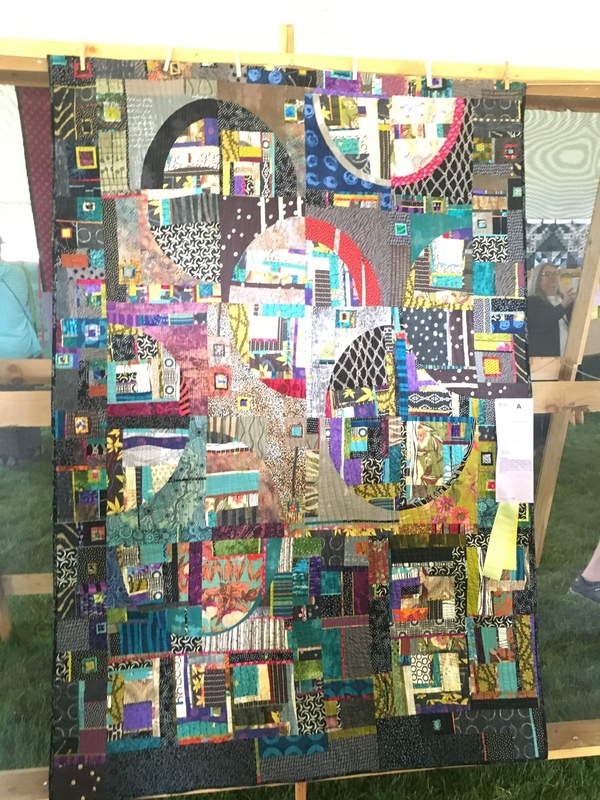 The coordinated effort of the entire Sisters Outdoor Quilt Show and Quilter's Affair is really something to see. Hoping to be back there soon! 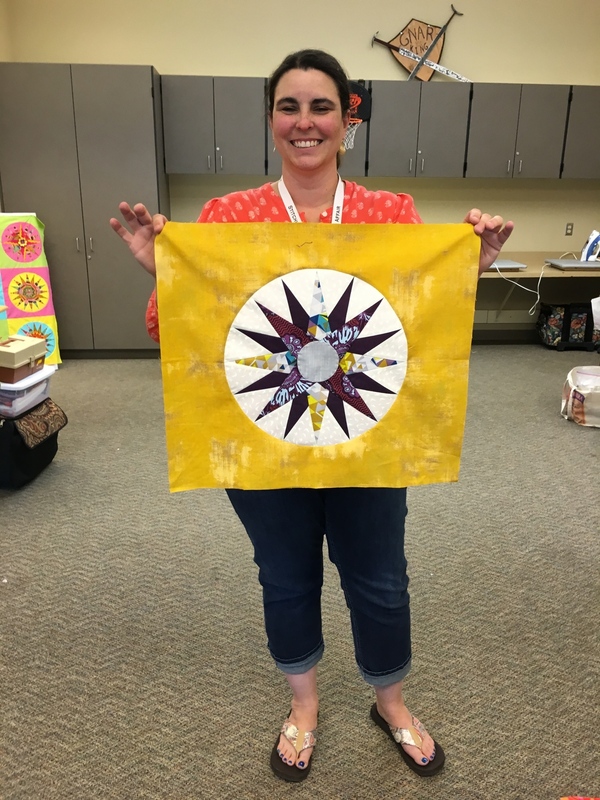 Mariner's Compasses by the Sea at Beach Tyme Quilts! More Compasses at Quilted Strait!